Muğla, being one of the oldest settlements of antic Caria Civilisation, has a magnificent history to accompany its natural beauties. There are so many attractions and sites within the city. Some of these are known busy touristic attractions and others still waiting to be discovered by the tourists. You can join on our Undiscovered Mugla trip from Dalyan to see the best of Mugla and the ancient city of Stratonicea. Kurşunlu Camii (Leaded Mosque): It was built in 1495 by Esseyit Şucaeddin in Muğla city centre. It has a entered planning and a large dome. Two small domes of the side was removed during restorations made in the 19th century. During this renovation, leads on the dome was replaced and engravings were re-painted with the inks brought from Rhodes. Ulu Camii (Grand Mosque): It is one of the largest mosques in Mugla city was was built by the Menthes Governor Ibrahim Bey in 1344. The mosque has lost its original structure as a result of repairs that was made in the 19th century. There are repair inscriptions left on the altar of the last congregation place. Şeyh Camii (Sheikh Mosque): Built in the city center in 1565 by Sheikh Bedrettin. The minaret was added at the beginning of the 19th century. Sheikh Mosque has had two repairs in the 19th century. There are inscriptions from the first repair at the right side of the entrance door. 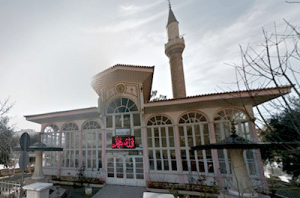 Hacı İlyas Camii (Haji Ilyas Mosque): The mosque is located in Milas Haji Ilyas neighbourhood. It was built in 1330 by Sucaeddin Orhan during the ruling of Mentesogulları. There is a single nave with three sections of worship areas in front of the narthex. The dome and the roof is covered with corrugated tiles. 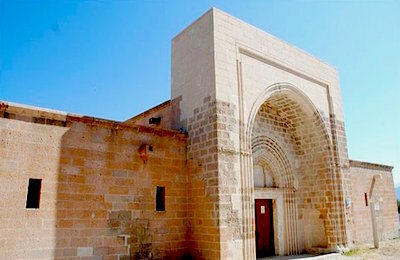 Firuzbey Mosque: It is in the Firuzpaşa neighborhood of Milas. It was built in 1394 by Mentesoglu Governor Hodja Firuz Bey. Built in Inverted “T” structure, madrasa rooms found on the garden area. Because of the leads used in the coating of the dome, it is also known as the “Leaded Mosque” among locals. s of the plan is similar to the Great Mosque, it is divided into three parts with two rows of columns in threes. Aga Mosque: The mosque is located in Milas Haciapti neighborhood, was built in 1737 by Abdul Aziz Agha. The rectangular mosque is a simple building with a pitched roof and a narthex. The minaret was built in 1885 by Mrs. Refia. Madrasas that used to be in the same place with the mosque has disappeared completely in time. Ahmet Gazi Madrasa and Tomb: Located in Beçin Town, the madrasah located outside of the citadel is the oldest structure still remains intact. According to the inscription found on the gothic style monumental gate in south side, it was built in 1375 by Ahmet Gazi. In the courtyard of the madrasa around ten rooms are located. Each madrasah consists of a small room with a stove and barrel vaulted on top. Ahmet Gazi Madrasa is located opposite the entrance of the tomb. The tomb, which is covered with a high dome, opens into the madrasa courtyard with a Gothic style pointed arch. 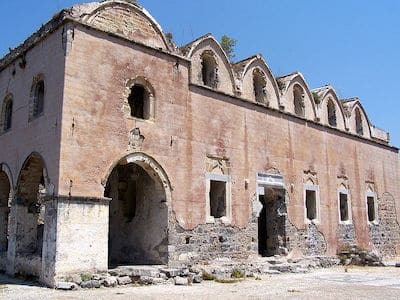 Lower Church (the Church of Panagia Pirgiotiss): The church located in Kayaköy (The Stone Village -or- Ghost Village) in Fethiye was used until recently. There is a date of 1888 on the Mosaics founded in from of the northern entrance door of the Church. It is assumed that this is the date of the renovation made. Upper Church (Taxiarthis Church): Also located in Kayakoy (The Stone Village -or- Ghost Village) in Fethiye the Church is thought to be built before the Lower Church but there is no definite date. Unfortunately the interior of the church has been destroyed more than external. Mugla Province is famous with its white painted, red roof-tiled houses. In these two-storey houses all rooms open to a large hall called “hayat” (Life). Rooms have wooden ceilings decorated with carvings. Each room is furnished with a stove and cupboard which beds are stored in. The park is located within the district boundaries of Fethiye of the province Mugla. The park has wonderful coasts with excellent view, untouched flora and fauna and various water sports opportunities. Myrtle, guilloche, carob tree and macquis are found in the area where alder is the dominant type of tree. Visitors of the park can participate in all kinds of water sport activities within the park, can have picnics; there are also accommodation facilities within the park. 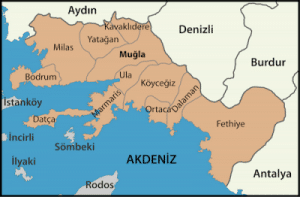 The area is in the village of Meselik, near Milas, in Mugla province. 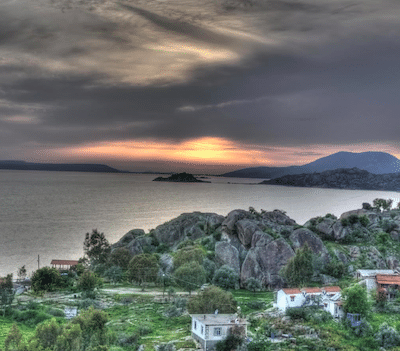 The area is 23 km away from Milas and 25 km away from Bodrum, and is easily accessible from both towns. The most distinctive feature of this area, which covers an area of 760 hectares, is the halep pine which is a rare species in Turkey. Other species include cluster pine, mastic, oak, wild olive, laurel, spruce and mountain strawberry. Animals inhabiting the area include fox, jackal, wild boar, rabbit, hedgehog, partridge, water hen, and black hen. Located to the southwest of Koycegiz Lake at the foot of the Ölemez mountains, the history of Sultanate Thermal Springs dates back thousands of years. It is known that the hot springs were used by the people of Caunos at BC 100. During the Byzantine period, facilities were expanded and accommodations were built. These facilities were later flooded and now lay under the waters of Koycegiz Lake. During Roman period, facilities were transformed into a comprehensive hospital. According to sources, at the hospital’s entrance “Death is not allowed here in the name of God” was written. Ölemez (Can not die) Mountain has taken its name from here. 6 kms from Dalaman Airport hot springs with temperatures of 28 C contain rich mineral composition. High oxygen levels have therapeutical effects of all skin types, rheumatic arthritis, neurological illnesses, digestive system and are known to be beneficial to women. On the road to Saklıkent, 35 kms from Fethiye, Girmeler hot springs found right outside of Gebeler Village. At the entrance of Gebeler village, there is a cave called Girmeler and hot waters spring out inside of this cave. Water carried with pipes from one of the springs fill the pool in the facilities run by the Gebeler Village Cooperative. Other springs in the cave run naturally into the mountain after making maze of pools. 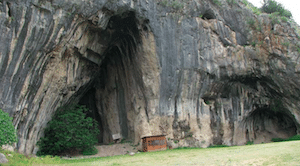 There is a 50 room capacity accommodation facilities right outside of the cave. Ölüdeniz (Dead Sea): Described as “Eden bestowed by God to World”, Oludeniz has a 3 km long beach. Oludeniz offers insatiable pleasure of swimming in waters where light and dark blue is intertwined with light and dark green in a color harmony. With a natural lagoon view its waters are warm and stagnant ten months of the year. Oludeniz is one of most favored beaches by domestic and foreign tourists. Kıdrak: At 3 kms south of Belcegiz, Kidrak Bay is an ideal resting place with its dense pine trees, clean beaches and clear sea. 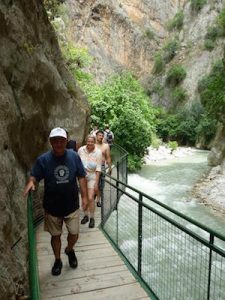 Butterfly Valley: Around 7 km away from Ölüdeniz, surrounded by approximately 350 meters high mountains, this interesting canyon takes its name from the “Jarsey Tiger” butterflies seen around between July – September. With small waterfall flowing summer and winter, wide sandy beach, clear waters, sparkling pebbles and pink oleander flowers this small cove is a heaven on earth. 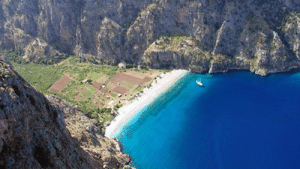 You can visit this place by joining in one of the boat trips from Oludeniz. Tent camping area, restaurant, bar and shower facilities are available in the valley which is the meeting place of world wanderers. 12 Islands: Adorned with numerous beautiful bays and islands, known by fishermen as “Darkness Within”, Kapıdağı Peninsula is one of the indispensable stops for Blue Cruise gullets. Reached by the boat trips arranged from Fethiye and Gocek, Yassica Islands, Hamam Bay, Leaded Bay, Yavansu, Bedri Rahmi Bay, Shipyard Island, Göbün Bay, Boynuzbükü, Gocek Island, Hog Island, Olive Island, Red Island are amongst the main stops in 12 Islands region. Oyuktepe Bays: Including county’s two major resorts and natural coves such as Küçük Samanlık, Boncuklu, Kuleli, Aksazlar, Akvaryum, Tunç Pınarı the bay is a favourite of mostly local people for daily promenade. Katrancı Bay: Located on Muğla – Fethiye highway 17 kms from Fethiye. With its frequent pine trees stretching to the sea, it exhibits the most beautiful harmony of blue and green. Forest recreation area, shower, toilet, cabin, drinking water, buffet, arbor, services such as car parking is available in the facilities established in the bay. Ideal for camping and picnic areas. Günlüklü Bay: 18 kms from Fethiye on the Muğla highway this bay is adorned with endemic Liquid Amber (Günlük) Trees, which is know with its therapeutical effects on treatment of many diseases (itching, asthma, bronchitis, ulcers and stomach disorders). Liquid amber oil is also used in cosmetics and perfumery industry. Calış Beach: 5 km distance from the city centre, opposite the Knight Island with its 4 km of sandy beaches along the hotels, hostels, campsites and restaurants known as one of the best places to watch sunset on earth. The beach is nesting area of Caretta Caretta Sea Turtles and is one of the most popular touristic areas of the county. Hisaronu – Ovacik: These two typical Turkish villages in Ölüdeniz resort became a shopping and entertainment centre of tourism. Being close to other sites like Oludeniz, Babadag and Kayakoy (Stone Village) these two villages nowadays especially attract the attention of foreign tourists. Saklıkent (Hidden City): This place is a natural beauty hidden in a 18 km long spectacular canyon reaching heights of 600 metres. It is located 50 kms from Fethiye at the edge of Karaçay (Black Stream), which constitutes the border between Muğla and Antalya provinces. With its steep cliffs, plane trees and clearly flowing spring waters it is a unique tourism centre for nature lovers offering mountain climbing, hiking and swimming facilities. 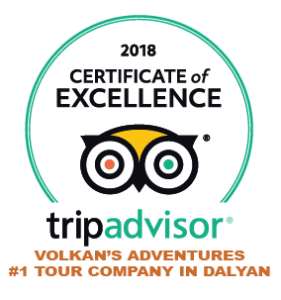 Yakapark: Created by combining the vast wealth of the nature with human labor, this unique recreation spot filled with the sound of water and the sound of birds offers unforgettable moments of mystery. It is located 2 kms away from the Yaka Village. Cennet Adası (Paradise Island): Paradise Island can be reached by a 30 minute trip from Marmaris and it is actually a peninsula covered with forests. Service units such as restaurant and pensions are available and place is a frequented stop for daily tour boats. It is an ideal spot for swimming and recreation. 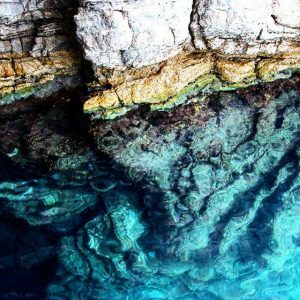 Fosforlu Mağara (Phosphorus Cave): This natural cave is a place frequented by tour boats from Kumlubuk and Turunc which offers opportunities to swim in the turquoise and green waters reminiscent of an aquarium. 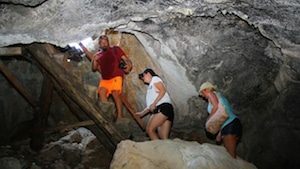 İçmeler (Drinkings): Located 10 kms away from Marmaris Centre, it is not only one of Turkey’s top destinations with its entertainment facilities and beach but also known with its drinking water that is believed to be good for the digestion. Turunç (Sour Orange): It is possible to reach Turunc both from the sea or land from Marmaris, which is 21 kms away. Today the village is known to have any kind of comfort in an old fishing village with tourist facilities, open air restaurant with pension and still attracts the attention of domestic and foreign tourists. Kumlubük: Located 6 kms from Turunc, Kumlubuk can also be reached by boats from Marmaris. Intertwined with the green and with clean sea and wonderful sand beach, it is one of the most popular destinations in the region. 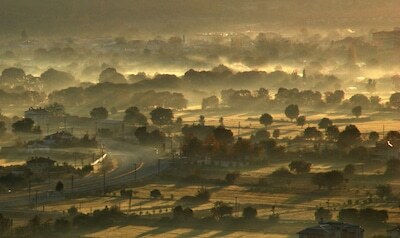 Çiftlik (Farms): Reachable via a 2-hour journey from Marmaris, it can also be reached by land through Bakır Village. With its large sandy beaches and arbor restaurants it is a common place to stay especially for yachtsmen. The village has a small island in the bay and also a frequent stop for jeep safaris. Yalancı Boğaz (Liar Strait): This piece of land is located 8 kms away from Marmaris. Its named after a ship captain run ashore on a stormy day thinking it was a strait opening to the gulf. Home to shipyards making wooden gullets, this region is surely one of the places must to be seen. 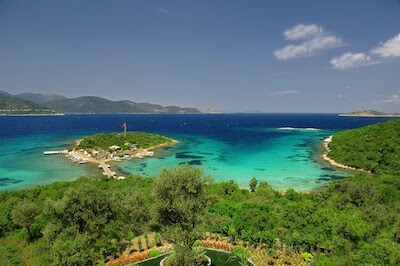 Guvercinlik: 25 kms from Bodrum, it is a beautiful bay where blue meets green. Besides the natural beauty and endless dovecotes, it draws attention with Salih Island opposite the bay. Torba: It is a quiet village 5 kms away from Bodrum. Pine and olive trees’ greenery mingle with the sparkling sea in this small village. You can join one of the boat trips to Didim, Miletus and Priene from here. Gumusluk: It is one of the oldest settlements on the peninsula. It is possible to see the remains of the old harbour linking the Rabbit Island to the mainland. Gumusluk is famous for its crystal clear sea and fresh sea food also with its notable wealth of flora. Akyarlar: Stunning bay with a sandy beach and a sparkling sea, which is 13 kms away from Bodrum. The ancient name of Akyarlar was Arhialla. The bay draws attraction from surfers as it has extremely favorable conditions for surfing. Aspat: Mentioned in folk music, old name of the town was Aspartos. Remains of several civilizations dating back to the Classical Age can be seen in the area. Ortakent: Famous for its warm sea and tangerine orchards, Ortakent is one of the most convenient spot to observe the village life in Bodrum. Ekincik Bay: Located 40 kms southwest of Koycegiz, the bay is always reachable by land and sea. Ekincik Bay is a natural harbour where 50-60 yachts are docked a day. One of the most important stops for Blue Cruise journeys, the bay attracts the attention of domestic and foreign tourists with its large sandy beaches and azure colour clean sea. 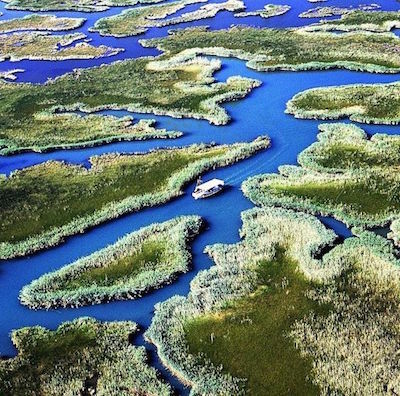 Dalyan Strait: Those who join on one of the boat trips from Köyceğiz to reach the Mediterranean through Dalyan, experience a magnificent journey going through labyrinth like read-beds. Pass. During the summer season every day boat trips are organised to Bodrum and Marmaris. 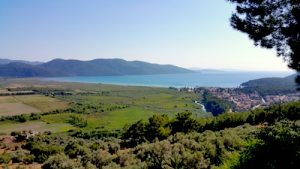 It is also a must do to join one of the boat trips from Akyaka and sail through bays and coves where dark blue waters meets ever green landscape. Dalaman’s mountainous and wooded sections offers extremely favorable conditions for mountain tourism. Sarsala, Büngüş, Poruklu of Akbük, Boynuzbükü, Taşyaka, Sıralıbük, Hamamlar and Kurşunlu are favourite stops for the coastal Blue Cruise tours. Kargı, Palamutbükü and Mesudiye bays are the most beautiful places worth seeing in Datça Peninsula. Iztuzu Beach: With its 6 kms long fine sand beach surrounded by pine forests, crystal clear blue sea and plenty of sun as well as being a major breeding and shelter habitat for endangered Caretta Caretta sea turtles, the beach has gained a worldwide reputation. On southeast of Mugla, 3 kms from the city centre, woven with mountain roads called “irim”, with its cold water, fertile soil, high trees, abundant fruit trees, grapes, vegetables, tobacco and its a famous “Well Büryanı Kebab” unique to the area , beautiful view of whitewashed homes seen among green trees it is a out of earth, cool resting place. Every house has their own deep wells with cold water. The sound of the pump connected to these wells, upon mixing with the sounds of birds reveals a completely different natural beauty. The tradition of spending the hot summer days in the highlands are still ongoing. 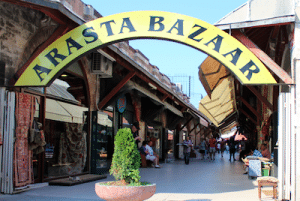 You haven’t seen Muğla if you didn’t visit Mugla Thursday Market and Arasta Old Bazaar and haven’t seen Mugla Houses. You must see a Muğla wedding and must visit Karabağlar Plateau.